Join Certified Zentangle® Teacher Rosie Hill at Coos Art Museum on Saturday, November 5, 2016 from 1:30 pm to 3:30 pm for “Zentangle in Full Bloom in full color” Traditionally, Zentangle is drawn in black and white. When color is added, it becomes “Zentangle Inspired Art” or ZIA. 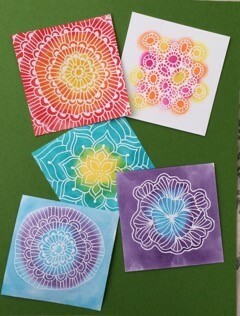 And who can resist adding color to the blooming, blossoming tangles that were taught in our September class? “Resist” is a key word: we will create our tangles with a resist technique, adding color over the patterns that remain white. Zentangle experience is recommended, but not required. All materials are included in class fee. Zentangle books and other supplementary materials will be available for purchase. Teens and adults of all skill levels are welcome. Class size is limited to 20 participants. Class Fee: $30 CAM members / $35 non-members. Registration ends November 5, 2016. For registration go to www.coosart.org or visit Coos Art Museum at 235 Anderson in Downtown Coos Bay.